Absolutely stunning freshly built 1956 Chevrolet Corvette Retro-Mod. Classic Corvette Styling, contemporary high performance options and much desired high quality creature comfort is the heart and soul of this vehicle. 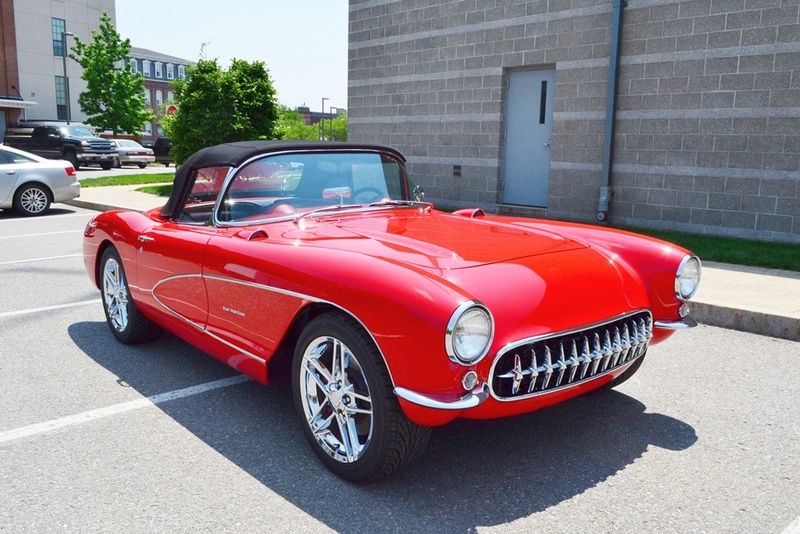 Built by long time Corvette Restorer and well respected NCRS master Judge, with extensive automotive experience his attention to detail and pride in craftsmanship is evident throughout this 1956 Corvette Rest-O-Mod. Well sorted and ready to be proudly and enthusiastically driven with thorough enjoyment. Powered by a GM LS 3 (6.2 Liter) 400hp engine mated to a ZF 6 speed manual transmission. The flawless body sets on a Billy Dawson Corvette Correction chassis, with C5 Corvette Suspension and upgraded power disc brakes brakes. Complete with Ididit Steering Column, Power Rack and Pinion Steering, American auto Wire – Wiring harness, B-Cool Radiator and Vintage Air AC. The gauges were done by Classic Instrument including an electric Speedometer. Music comes from a Retro Sound Model Two Radio with Bluetooth, iPhone and iPad compatibility. The speakers are Rockford Fosgate Prime Full Range Speakers. Soft Top is Al Knoch Cloth Stay-Fast, Seats are Al Knoch Custom Leather it rides on Chrome C5 Z06 wheels and radial tires. Provides awesome acceleration on demand, respectable fuel economy when cruising and exceptional braking if needed. If you are looking for an exceptional build that is a truly exciting ride which brings back memoires of a great time in America yet offers contemporry performance and comfort, this car offers a rare opportunity to acquire it all.